Anime-zing Funtime Blog: Your Stream Assignment For Today: Check Out Oh! Edo Rocket! Your Stream Assignment For Today: Check Out Oh! Edo Rocket! The cast of the show is disappointed that you haven't seen them in action yet! Some series are really underrated, and sadly those are the ones I enjoy the most. One such overlooked series goes by the name of "Oh! Edo Rocket!" 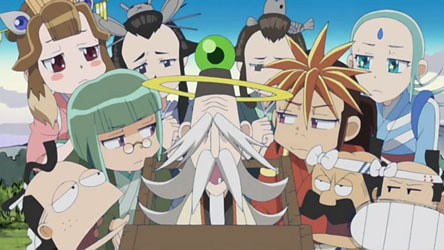 Really, any fan of Edo period anime or FLCL should really enjoy this series. Unlike most anime, this series is based off of a stage play, so there are some theatrical tropes in this show that make it quite epic! So today's assignment is to watch a couple episodes of this excellent comedy/drama series. Since Funimation won't let me embed the video on this site, I will just have to link you to the show's page. You can have your choice in watching it either dubbed or subbed.